Обзор BMW m550d xdrive 2019 | ТО-Авто. Even though it has an M badge, don’t think of it as a diesel M5. Highs: It’s a diesel station wagon, quad-turbo bragging rights, 561 lb-ft of thrust. Lows: Lacks the athleticism its M prefix implies, denied to drivers — natch. A drive in the new M550d Touring—that’s “station wagon” in Continent-speak—has made us dream of a utopian parallel universe where stylish longroofs with compression-ignition engines still make commercial sense on both sides of the Atlantic. Wouldn’t you rather drive this than a me-too premium crossover? It’s hard not to see a degree of one-upmanship in the decision to add another turbocharger to the 3.0-liter diesel inline-six that powered BMW’s last generation of 50d models, a go-one-better response to the triple-boosted V-8 TDI in the Audi SQ7and the Bentley Bentayga diesel. But with European buyers increasingly turning away from diesels and BMW planning a range of high-performance hybrids in the next few years, historians might well look back at the 394-hp unit in this 5-series as one of the high-water marks for compression ignition. Still, compared with the gasoline-powered M550i, the M550d is slightly inferior on paper. The diesel engine’s output falls short of the gas-fired twin-turbo V-8 by 62 horsepower. No surprises that the diesel wins on torque, though, with a towering 561 lb-ft against the V-8’s peak of 480. BMW’s stated acceleration figures for the M550d sedan—4.4 seconds from zero to 62 mph—put it 0.4 second behind the carmaker’s claim for the M550i sedan, with the M550d Touring adding another 0.2 second to that. (The M550i is not currently offered as a wagon, even in Europe.) Yet for anything except the unlikely scenario of regular trips to the drag strip, that really doesn’t matter. The effortless way this uber-diesel delivers its performance is central to its appeal. While the new B57 engine boasts only modest performance increases over the old tri-turbo unit—18 horsepower and 15 lb-ft—initial response has been improved. It uses two smaller turbos at lower speeds assisted by one larger one; if a big load is demanded at low engine speeds, some active plumbing briefly bypasses the low-pressure turbines to help spin the bigger rotor. The fourth turbo adds extra assistance above 2500 rpm. 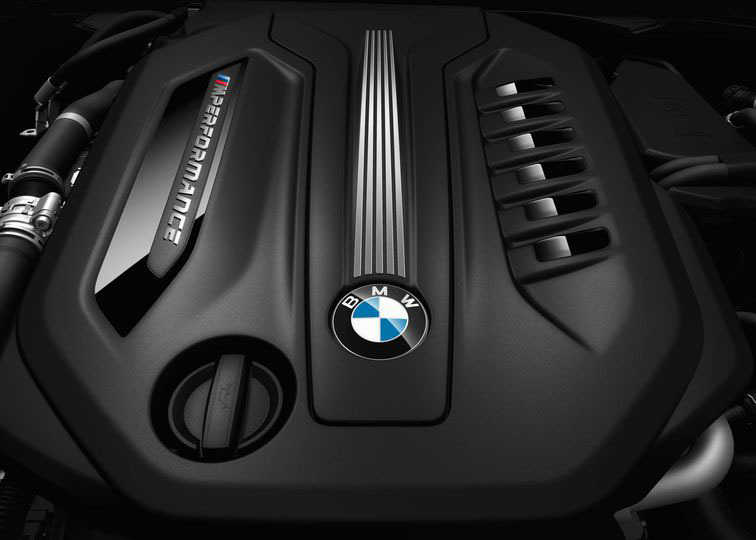 Peak torque of 561 lb-ft is available from 2000 to 3000 rpm, but BMW claims the engine is already making 332 lb-ft at just 1000 rpm. Only modest pressure on the accelerator pedal is needed to produce seatback-squashing thrust, as the M550d gathers momentum like an unladen passenger jet on a short runway. We drove the car on some of the mountainous roads of the Andalusia region in the south of Spain rather than on a derestricted autobahn where the car would have felt more at home, so there was no chance to explore the claimed top speed of 155 mph. Yet even on the mostly short straights of our route the speedometer needle swept effortlessly toward triple digits, the rate of acceleration barely seeming to diminish as the numbers climbed. The engine lacks the aural character of the M550i’s V-8 or even Audi’s V-8 TDI; the soundtrack is muscular but distant, and it doesn’t grow significantly louder as the engine approaches its limiter. The tach shows a redline at 5500 rpm, but the ZF eight-speed automatic will always upshift well before that—even in manual mode the transmission refused to allow more than 4700 rpm. Yet the linearity of the torque curve and the deftness with which the gearbox shifts on its own to keep the thrust seamless means this limitation doesn’t feel onerous. In eighth gear the engine turns just 1200 rpm at an indicated 60 mph yet will still pull strongly with only the scantest hint of lag. 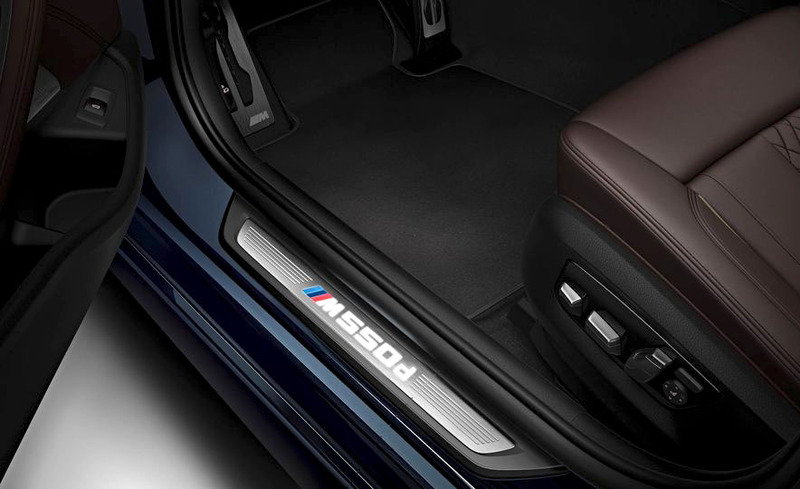 The M550d uses the same xDrive all-wheel-drive system as the M550i, and although it is capable of delivering a rear torque bias, it lacks the ability to switch to rear-wheel drive as can the M5. On tight Spanish roads, the handling balance felt front-heavy, with the M550d understeering in tighter turns and prioritizing traction over any sense of rear-end playfulness coming out of slower corners. The variable-ratio steering almost entirely lacks the talkative feedback that used to come as standard with any M-badged car; responses are clean and accurate, but gloopy weighting smothers sensation. Like its gasoline-powered sibling, the M550d is definitely happier being driven at a brisk pace rather than flat-out. On tight roads it feels its size, and although the standard air springs and adaptive dampers do a fine job of keeping the car’s roughly 4500-pound mass under control over broken surfaces, there is some noticeable lean in hard cornering, certainly more than any full-on M-car would be allowed. The brake pedal also softened noticeably when asked to deal repeatedly with the speeds the car is capable of reaching on even modest straights. While hugely fast and impressively comfortable, the M550d doesn’t deliver quite the athleticism we expect from BMW’s M GmbH division. 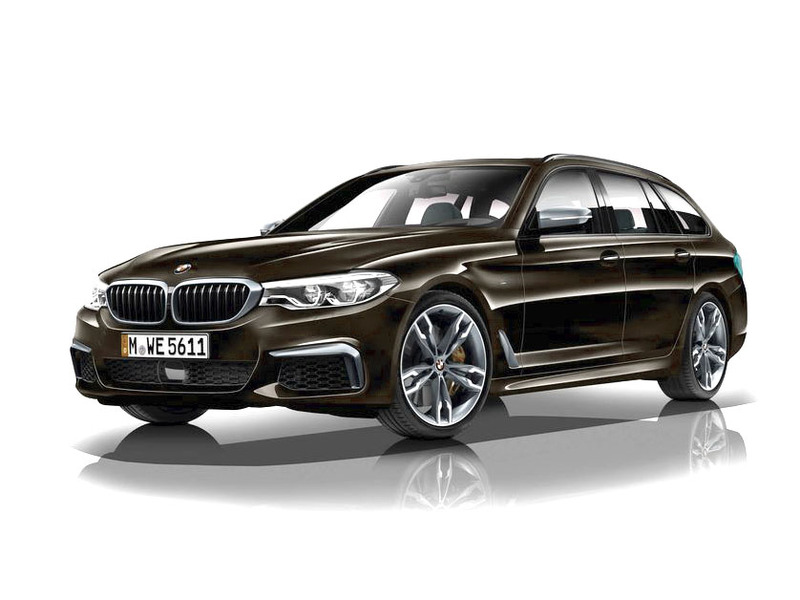 BMW has no plans to offer a Touring version of the current M5, so in Europe the M550d is its top-ranking longroof, with buyers having to find roughly $85,000 in Germany. Still, we can’t think of a better way to traverse its home country’s limit-free highways with family and luggage while averaging triple-digit speeds and long stretches between refueling. And although we can understand the marketing argument that denies the United States diesel station wagons, we wish things could be different.